This is the second French paperback edition of Talking God, the ninth book in Tony Hillerman's Navajo Mystery Series. 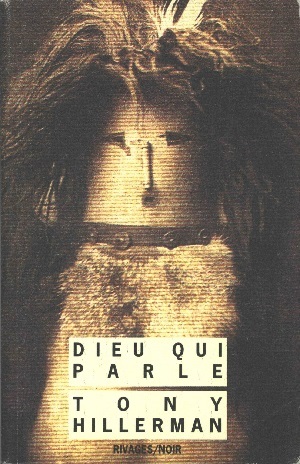 This edition is a Rivages/Noir novel published in Paris, France in 1991. It is a reissue of the 1990 Rivages/Thriller edition and is significantly smaller than the 1990 edition. Both editions use the same ISBN number but have different capitalization of the title. The text was translated by Danièle and Pierre Bondil. The cover illustration, though not credited, is a photograph by Edward S. Curtis of the mask of a female deity who appears with Talking God in the Navajo Night Chant.